Fantastic job folks. Very inspiring work. Keep it up... as I'm sure you will. CanadaWantsTheTruth on Wed, 12/05/2007 - 10:27am. and yes we do want it! patrick on Wed, 12/05/2007 - 11:46pm. Makes me wish I was in Santa Monica for the day. It appeared to be a great day for Truth. Patriots are simply the greatest. greenback on Wed, 12/05/2007 - 11:12am. Keep up the good work. Love you all. joann on Wed, 12/05/2007 - 1:38pm. MG on Wed, 12/05/2007 - 2:04pm. The Eleventh of Every Month TruthAction for November was heavily promoted and organized by the newly formed LA chapter of We Are Change with members of 9/11 Truth LA participating, as well as visitors from as far away as New York City, Florida, Tennessee and Nevada. This was the first truly regional action held in Los Angeles with 9/11 Truth activists attending from Sacramento, San Diego, Orange County, Riverside, Simi Valley, Ventura, Rancho Cucamonga and other cities as well. Participants in the march and street action at Santa Monica Third Street Promenade were estimated to have numbered approximately 125. According to Cosmos of www.TruthAction.org the originator of these monthly actions, this may have been the largest march anywhere on the Eleventh, outside of those occurring on the actual anniversary of the September Eleventh attacks. 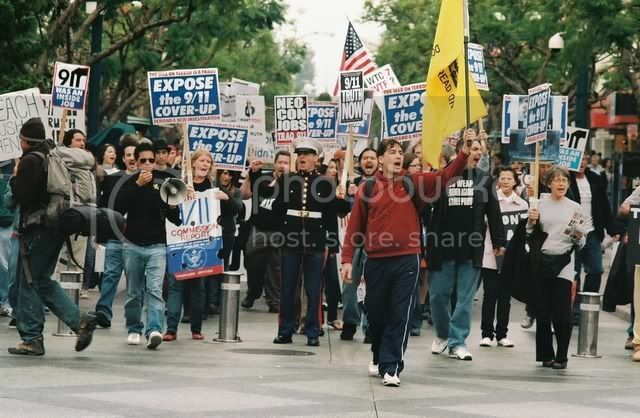 9/11 Truth LA's media march on Sunset Blvd in September had an impressive 50 attending. The Veterans Day Sunday event began on the bluffs above Santa Monica Pier with opening remarks by Bruno Bruhwiler and members of We Are Change LA www.wearechangeLA.org USMC Corporal Johnny Wave of Marines for 9/11 Truth also greeted the crowd. There were plenty of signs, DVDs, info cards, Deception Dollars and other hand-outs that were shared among the group, and the march began through the park and up Ocean Avenue. The procession drew a lot of attention and honking horns as it made it's way to the Third Street pedestrian mall and down the entire length of three blocks. Almost everyone in sight was offered a DVD or other 9/11 Truth information. Sometimes the march slowed enough to engage people in conversation. The reaction was very positive, as it was from the SMPD also, who observed, but did not interfere. Some reported to have had very friendly and productive exchanges with the officers as well, discussing evidence of the 9/11 crimes and the need for a real investigation. After making their way down Third Street, the marchers headed for the Santa Monica Pier, where they quietly and respectfully passed Arlington West, the Iraq war memorial on the beach below. Although it was requested that they not actively participate in the Veterans Day ceremony there, some of the marchers did pay a visit and took some stunningly beautiful photographs. The large group paused for awhile at the pier's end, and then returned to the bluffs above the shoreline. The group then divided into four outreach teams and took positions at four major intersections on Third Street to continue their visibility actions and engaging passersby with a fresh supply of DVDs and other materials. It had begun to rain lightly, which altered plans to set up an information table on the mall. After an hour or so, the group headed for a nearby eatery and watering hole, Yankee Doodle's, for a well-deserved celebration and socializing with new friends made. One special guest was Matt Lepacek of We Are Change NYC, who was impressed with the turn-out. Many attendees expressed their gratitude for such an inspiring event. Thanks and kudos ALL AROUND! The day's outreach was an absolute success! Randy on Wed, 12/05/2007 - 3:48pm. patrick on Wed, 12/05/2007 - 11:52pm. In addition to that; I am giving my first lecture on the federal reserve and NWO. Especially Maori, environmentalists and activists, who were heavily targeted in last months terror raids are open to information. Thanks for the inspiration keep it coming. travellerev on Wed, 12/05/2007 - 10:52pm. You make us all proud. Great work. Will forward this clip on to ALL! nothwind on Wed, 12/05/2007 - 5:20pm. Great job making the video, loved it. A message to all, Johny Wave is risking not only his career, and future, but his life also if you didn't notice. I don't know what people are waiting for. Shake the fear off you and start taking action!! What are you, a human being or a number? C'mon!! propan0 on Wed, 12/05/2007 - 8:12pm.